This deals roundup covers the best headphone deals from Flipkart Grand Gadget sale. The products we’ve listed are under Rs 1000 and are from brands like Skullcandy, Sennheiser and more. The Flipkart Grand Gadget sale starts today and will last till 26th of July. We have found some good deals on headphones, which are available under Rs 1k during the sale. The gadgets we have covered are from brands like Skullcandy, Sennheiser and more. The Sennheiser CX213 in-ear headphone is compatible with smartphones and tablets. The headphones feature passive noise cancellation that reduces outside noise for a better listening experience. One should keep in mind that the earphones do not have an in-line microphone or remote, which means you cannot answer calls directly from the headphone when it is connected to your smartphone. Click here to buy. The Flipkart SmartBuy Foldable on-ear headphones feature a swivel ear cup design that enables easy storage. The headphones come with a tangle-free flat cable that doesn’t let your wire tie up in knots. The device weighs around 200g and has an impedance of 16 ohms. Click here to buy. The Skullcandy Anti Stereo is an on-ear wired headset which is compatible with a wide range of smartphones and laptops. It has a 1.2m long cord and available in three colors red, white, and black. Click here to buy. The JBL C150SI in-ar Headset comes with an in-line microphone and remote that lets you pick up calls and adjust volume easily. The earphone box includes three sets of ear tips, which allows you to choose one that best fits your ear. 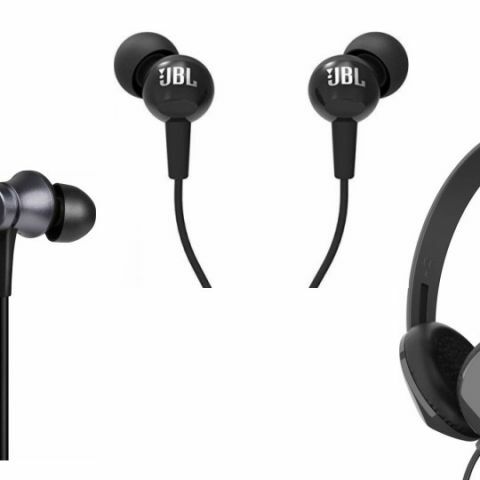 The JBL is also providing one year warranty that does not cover physical damage. Click here to buy. The Sony MDR-EX14AP is a wired in-ear headphone which features an in-line microphone and remote to manage calls and audio tracks. The headphones feature 9mm neodymium drivers and has an impedance of 16 ohms. Click here to buy. The Mi Basic Wired in-ear headphones come with an in-line microphone and remote that lets you play, pause, and adjust volume easily. It also has passive noise isolation, which reduces the outside noise to some extent. The headphones come with a six-month warranty that does not include physical damage. Click here to buy.